I’ve been wrestling for as long as I’ve been Blogging with the nature of salvation, what it means to be a Christian. Have you ever been talking about a friend or family member and the person with whom who you’re talking asks “is he/she a Christian?” and you don’t know what to say. Usually if you can’t answer the question it has something to do with the person’s behavior. Either they act to good for you to say ‘no’ without wondering or they act too wrong for you to say ‘Yes’ but you know they go to church and ‘believe.’ I hate trying to answer that question. Who am I to judge that? I’d like to say that the only people who are Christians are those whose actions and beliefs match. Sounds good doesn’t it? But it gets complicated when my ideas about acting it conflict with theirs. 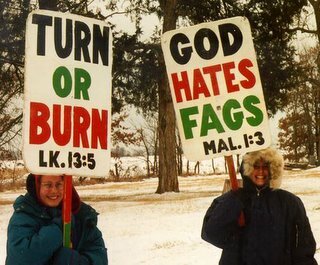 What if they think that holding signs with “God hates Fags” written on it is the best way to approach homosexuality as a Christian when I would say that there’s no way that a Christian could do that? What if someone believes that the best way to fight Abortion is to protest it by blocking the doors of an abortion clinic or throw things at women walking in when I would say that no way could a Christian do that? How do I answer the question without being ‘holier than thou’ or judgmental? I just don’t know. Not everything is as black and white as I like to think. We need to identify the tension; we need to recognize that this whole thing is not as simple as we’d like to think. I have no answers in this post… but I want us to know that we can’t be arrogant or closed minded in our answers because questions can be easily answered only by the ignorant. Great approach to a tough subject! ugh...this is painful. Its so hard not to become irate with the people in the picture, but then what would that say about how I love people? Thanks for putting this out there- its definitely a good dialogue path to take. It is really a tough thing. We can say that this or that action is not representing Christ and it just "steams me", but I guess we have to look at it as we look at everything from WWJD? 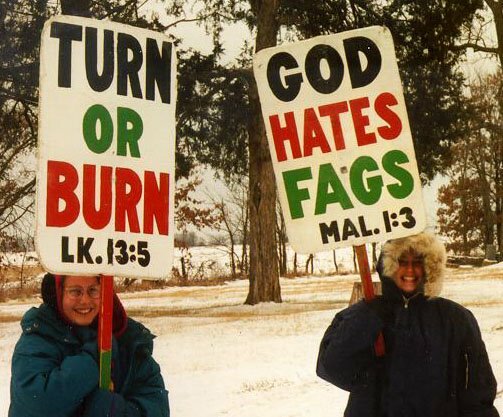 What do we think that Jesus would do or say to the people with the signs? I wonder? This is something that I have really struggled with lately--thnks I wish you could give me a great answer. God's answer to me was: Let me lead. Good post Wes...something worth thinking about. I'm glad that judgment is not left up to humans...I think God offers more grace than any human could. There is a great blindness upon the people of the church. The change machine of the 60’s has become the driving force. The thinking is if we protest, call fax write, or otherwise pester enough people things will change. We have got to get a grip since the time of roe vs. wade the signs have been waved, the petitions have been signed, and the votes have been cast… BUT no change! Are we pushing the repeat botton? Contrast this condition with the Book of Acts. For those who have only read the first 5 or so chapters keep turning the pages reading the exploits of those who have turned the world upside down by filling the world with their teaching, and without casting a single protest or vote. In reality the political activity was against the followers of Jesus. How will we change sin? By informing those enslaved by it that there is release and redemption and healing for what torments them in the loneliness of the night. Smiling picketers I don’t think so. Intercession between Kingdom standards and Hell’s standards - better choice. Informed intercession, find out why any action of sin is against Yahweh’s desire, seek restoration to Heaven’s will for the Earth. Those prayers touch The Father’s heart and move His hand of authority.